Welcome to Meow House Cat Rescue! We are pleased to utilize our website to show the public what we do and why we do it. Please feel free to browse through the site using the menu or clicking on the features. We thank you very much for your time, and for loving cats and creatures of all kinds just as we do! Do you already shop on Amazon? If so, you can help Meow House Cat Rescue at no cost to you! Just start at Amazon Smile and shop as normal...Amazon will donate 5% of your shopping total to Meow House! You can still use your Amazon Prime, still get all the same prices, etc. Just start at Amazon Smile and you'll be helping rescue more kitties. Thank you! 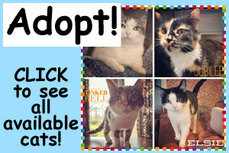 Saving cats and offering them for adoption in Raleigh, Cary, Apex, Garner, Sanford, Smithfield, and surrounding areas.